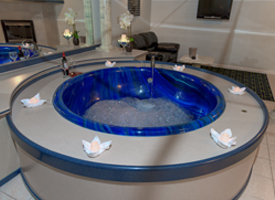 With five different room designs ranging from our basic one room suite with a heart shaped whirlpool tub and fireplace to our two floor Crystal Chalice Suite with fireplace, whirlpool tub, full bath and flat screen TVs, you'll be sure to find something you are looking for! 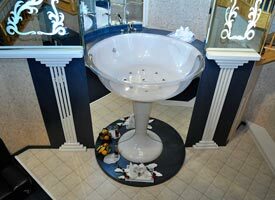 Each of our Suites are unique in design and professionally decorated to insure all your fantasies come true. 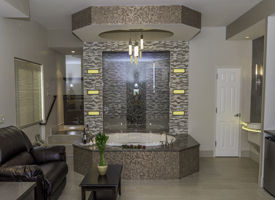 features oak staircases leading to a loft bedroom, which overlooks the Champagne glass style whirlpool tub. The room also comes equipped with the two T.V. 's, DVD player, refrigerator, microwave and coffee maker. combines the elegance of falling water with the shimmering of crystal chandeliers reflecting the warm glow of a fire. Rainforest décor, a waterfall and a heated pool. If there is ever an occasion to break out those Jane and Tarzan Outfits! 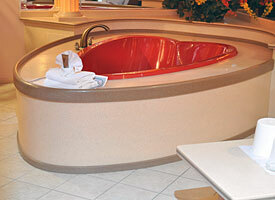 feature over-sized rooms with fireplaces, whirlpool tubs, heart-shaped beds and romantic floral decorations. are far from the norm. 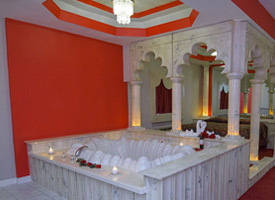 All of the rooms feature a whirlpool tub in the middle of the room, lavish floral decorations and most have fireplaces.